I'll be speaking to 4th year Law students of the University of Lagos at the TechnicoLaw Summit, hosted by members of the Taslim Elias Chambers of the Faculty of Law, UNILAG. The idea behind this summit is to invite reputable entrepreneurs from in different fields, who had Law as a foundation to speak to the students on how they have, so far, merged a Law background with working in different fields today. The students have identified a trend whereby students are picking up interests, learning new skills and constantly seek a way to get the best out of a law career and a solid interest. The fields that have been earmarked include photography, media, politics and fashion. The speakers are: Kelechi Amadi Obi (A-list Photographer, Kelechi Amadi Studios) for Photography, Chude Jideonwo (Managing Partner, Red Media Africa) for Media, Folake Coker (Designer, Tiffany Amber) for Fashion and Ayo Sogunro (Writer, Legal Consultant and Policy Advocate) for Politics. 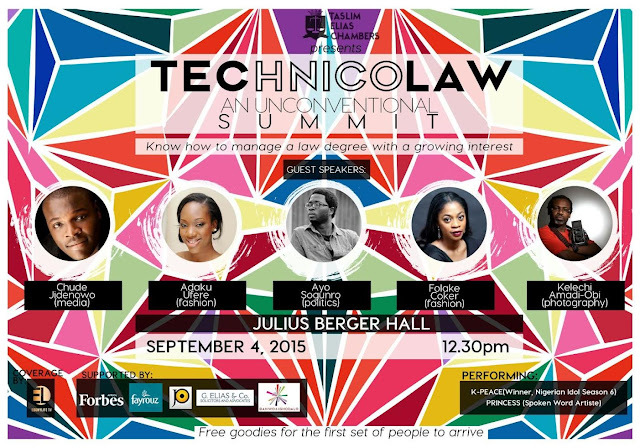 Theme: "TEChnicoLAW: Law beyond boundaries". The Grey Annual Sale + Giveaway!